What is Value-based Selling – Really? Value Selling. Customer Insight. Buyer Alignment. Sales 2.0. Sales 3.0. Challenger. Provocative Selling. Hypothesis Selling. There are myriad names for selling the most effective way. 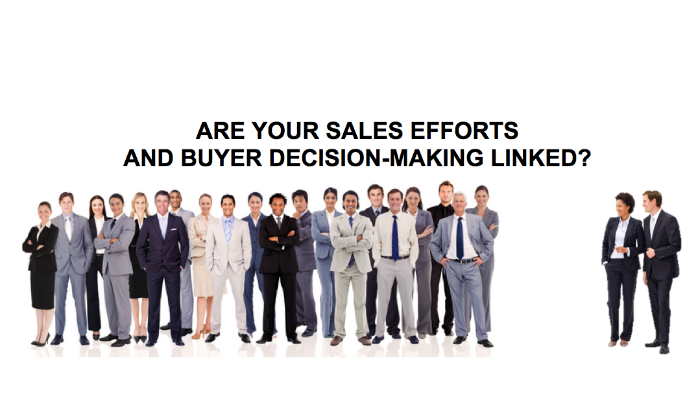 Unfortunately, the answer to the question posed above, “are your sales efforts and buyer decision-making linked?” is mostly no. As in, no 90% or more of the time according to B2B buyer surveys. Horrendous. No other area of business puts up with that kind of performance. And the pain that goes with? 40% loss to No Decision (see this great read by Kurt Laug, Selling to Dr. No), 56% forecast loss, deal slippage, discount degradation, missed quarters and more. 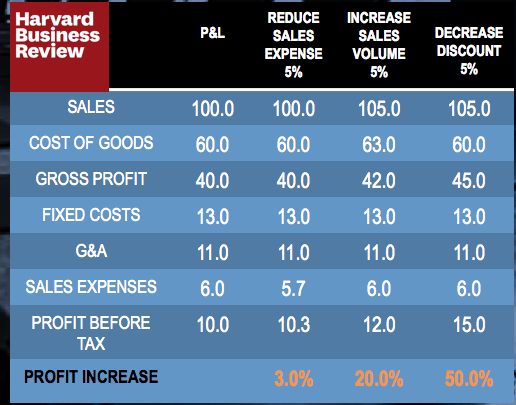 As you can see from the HBR graphic, increasing sales volume by 5% boosts profit by 20%. Even better, reducing discounting by 5% increases profit by 50%! This isn’t about cutting sales expense, it’s about selling the right way. The best way. The highest performance way. How we all want to sell. A great way to stay on top of (and contribute to) the future of B2B value selling is to participate in the newly formed “Value Selling and Realization Council”. No charge to join, the Council is a global, non-profit organization established by leading practitioners of value selling (providers) and realization (buyers). Members include organizations that execute value selling in their businesses, provide value selling solutions, do world-class research, and/or consult and train. The purpose of the VSR Council is to globally network as well as share best practices, thus helping to overcome the 2 biggest barriers to effective value selling…scalability of value resources and adoption of value approaches. Join the Value Selling & Realization Group, visit www.vsrcouncil.org and consider the upcoming Value Selling & Realization Summit in Dallas Feb 29 – March 1 (summit.vsrcouncil.org). Thanks, and good value selling! The Value Selling & Realization (VSR) Council is an organization made up of forward-thinking Sales and Corporate executives that operates with a central mission: Maximize value from investments in IT-enabled change by establishing and promoting value management awareness and understanding, standards, practices, and tools that enable technology vendors and enterprise corporate executives to collaborate in developing and executing a “roadmap to value”.